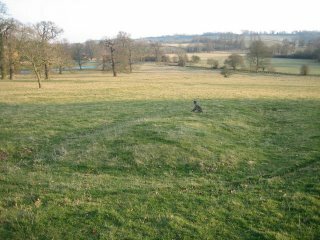 I think it is possible to make out this earthwork in the Park at Broughton from these pictures that I took at the weekend. Anyway it is a mound, about 30 feet by 8 feet, (the dog gives it scale). Pillow mounds are part of the normal agricultural landscape from the middle ages and later. This one may be 16th century. A pillow mound is for rabbit farming. You build up a false mound for your rabbits to make a warren in, and surround it with a trench. What sort of fence you used to keep the rabbits in I don’t know. 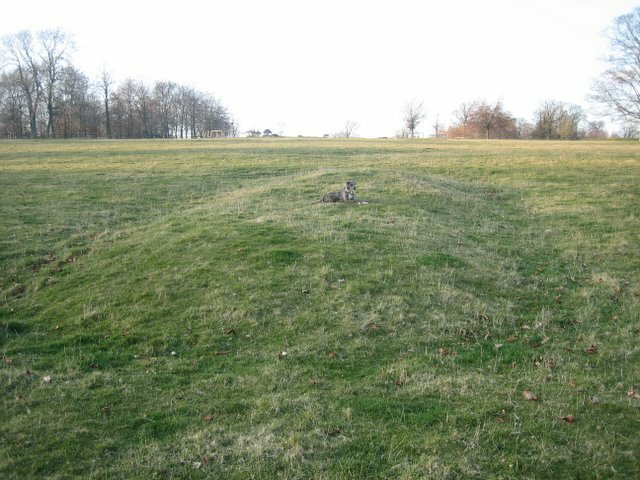 This is just one of a number of unusual bumps and ditches in the park, but next time you walk your dog here (which, by the way, you are welcome to do) you’ll know what this one is. This entry was posted on Monday, March 6th, 2006 at 12:10 pm and is filed under Broughton Castle.